I have a couple of kids that catch poison ivy very easily and one of them is my teen daughter. Living in the country like we do, there's an abundance of it but they know where most of it is and know to stay away from it. Right now the leaves are just popping out so I was surprised when she came to me and showed me her blisters. It was no sooner out my mouth then God flashed the neon 'Duh!' sign He has just for me. Why do some things effect me that don't bother or effect my Christian sisters? Because I go where poison ivy is and they don't. It's made me, once again, consider where I walk. Am I tip toeing through poison ivy hoping and praying I don't get it? It would be so much better if I just stayed away from areas where I know the poison ivy grows! This morning was filled with shuttling children and running errands, and because it's so nice, all the van windows were open. 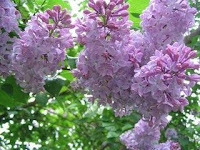 Sitting at a stop sign I smelled lilacs, and they were heavenly. I quickly looked around for the lilac bush, but I couldn't spot it. Over an hour later I was back in the neighborhood, picking up my girls, and I made sure to go the same way so I could enjoy those lilacs. I never did spot the fragrant bushes, but I decided I want to be just like them. As people come in contact with me, or even just pass through my neighborhood, I want them to smell the sweet fragrance of Jesus in my life. I want them to choose to pass my way again, simply to savor that fragrance, even if they don't know the understand the source. Lord, I want to be a fragrant aroma to You, sweet and pleasing and acceptable to You. I pray the aroma of my life would draw others to You, the source of everything. That's how the Bible is in our lives. The Bible, God's Word, gives us directions for living. We need to thoroughly read and reread the directions, and follow them each step of the way. God walks us through the steps and He holds our hands through the sticky parts, making it so we don't crash and burn and lose everything. By following His instructions we can make the changes needed in our lives and live to glorify our Savior. This last winter a lot of branches came down in the strong winds we had. Now those branches are being picked up by the flooding and are being added to other dead-falls that are trapped, causing dams, which are slowing down the drainage of the flood waters. Those dead-falls reminded me of sin. How many dead-falls are in my life, slowing down and even stopping the movement of the Spirit? I want the Spirit to have free reign in my life, which means I need to clean out and remove everything that will hinder Him. Sin acts like a dam and it has got to go. Well, last night we got our annual late frost. The nectarine and peach tress were blossoming but the frost got those. I love watching things bloom in the spring and I hated seeing those blossoms die instead of maturing into fruit, but I know things happen for a reason. For the fruit trees, the frost thinned out the many blossoms allowing the tree to focus its energy on fewer, but larger fruit. 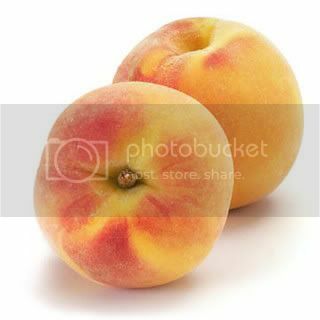 The thinning process isn't fun nor easy, but if you want a beautiful crop of large fruit it's necessary. Personally, I would rather have a few large, tasty pieces of fruit than small, wormy pieces. The other day we all went to the lumber yard and I thoroughly enjoyed getting out with the family. As we drove down the highway the sun peeked out for a few moments, illuminating the trees and I was able to see what had been hiding right in front of me. The trees were still barren, but when the sun hit them they glowed green. The green that makes you know there's life there, even though all appears to be dead. Lord, when people look at my life, do they see the green of Your Spirit living in me, or do they just see the barrenness of life without You? Help me to grow and glow so that they see You in my life. Let them see the light of Your love shining in me. and to soak up the Sonshine! See you on the Sonny side! On the way to church yesterday evening, we went past a pond that we've passed hundreds of times. When I saw shiny lumps lining the north bank I did a double-take, knowing there had never been rocks there before. 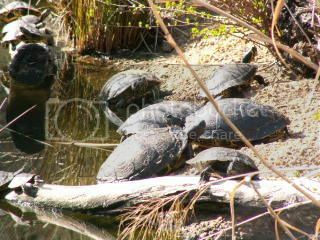 It was a crowd of turtles sunning themselves, but they were only on the north banking. It made me chuckle, until I realized just how smart they were. I was still marveling over them when we drove down Main Street, which is lined with pear trees that are beautiful in the spring. The trees on the north side of the street were in full bloom, but those on the south side were just beginning to blossom. I found the answer much faster the second time around, and not only did I marvel, but I was filled with the desire to be in a position where I could soak up the Son and begin to bloom. I want the advantage of the southern exposure, and like those turtles, I'm able to move and follow the Son. I don't have to miss a moment of Sonshine! I'll see you on the Sonny side. 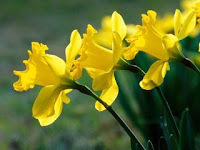 As we drove into town my six year old asked why everyone else had pretty daffodils in their yards but we didn't. How many times has it happened that just as it gets light enough to really start doing something outside, it clouds up and rains. Life often does the same thing to us. Just as life appears to lighten up so we can actually do something, a storm will blow in and the rain starts, stopping us from what we wanted to do. Is it that what we were going to do is bad? Not necessarily. Is it that God likes to rain on our parade? No. The rain cleanses the air and waters the earth so things can grow, and when the sun comes out again, everything appears brighter--it even smells better. Those are good things and they apply to life's storms, too. So, when life rains on us, remember that when it passes we'll be refreshed and brighter for it. We can't grow without rain to water us.